When I was first getting back to swimming to lose weight I found this stroke the easiest to use. I did not have the stamina, energy, muscle, power or breath to do the Freestyle stroke for the entire length of the pool. Freestyle is harder to master because it’s so many components plus timing the breathing right. If you don’t have the fitness level yet it can take a lot out of ya! On the other hand, Breastroke was always easy for me. I could catch my breath with every stroke. 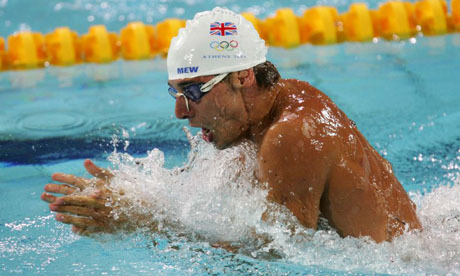 Breaststroke: Breaststroke involves the simultaneous movements of the arms and legs. The hands are pressed out in front of the breast in a heart-shaped pattern. The kick is simultaneously performed in a circular motion just like a frog. 1. Kick off the wall and remain under water as you start. 2. At start and after each turn, take one stroke while fully submerged and then bring arms back beyond your hips. 3. The head must break the surface of the water before the hands turn inward at the widest part of the second stroke. 4. Hands should be brought forward from the breast below the surface of the water. Extend your arms straight ahead over your ears. 5. Pull with your hands and arms. The force of which you pull determines how good of a workout you get, and how fast you will be. 6. At this point, it’s time to breathe. As your arms are pulling the water, pick your head up and take a breath. Don’t stay above water too long because it will slow you down and you will inhale water. It’s a quick burst, exhale, inhale, go back under water. 7. When your hands reach your chest, your hands will meet and shoot your arms forward and repeat. 8. The kick for breaststroke is called the frog kick . After you push off, your legs should be straight. Hold that position until your arms start the pull. Midway through the pull, bend your knees together and up towards your stomach. Form a “V” with your legs. 9. Press your legs together to make your body straight again. Like anything this stroke takes practice. Once you get better at it, challenge yourself to “sweep” the water harder. It will work your arms and shoulders more and increase your heart rate. QUESTION: Have you tried swimming for weight loss? What was the result? This morning I was thinking about you when I was swimming. Just thought I would let you know. You are a great motivator…keep it up! 1 mile in 30 minutes is great! Good for you!! !